How to prepare a cappuccino? 1 How to prepare a cappuccino at home? 2 Where the name of cappuccino coffee? 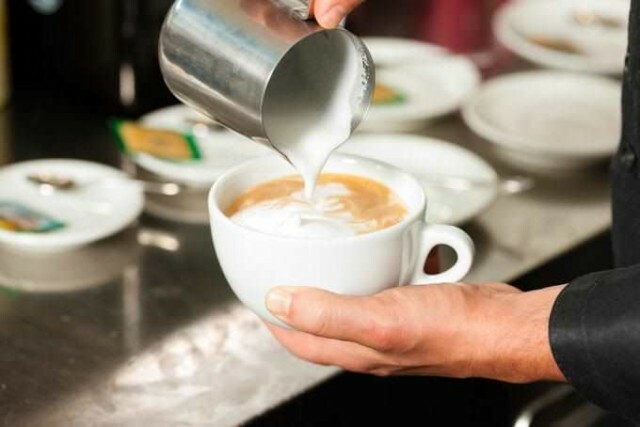 3 How and when to drink a cappuccino? 4 Are there many types of cappuccino? Coffee with whipped milk foam from the warmed milk first came up with the Italians. Cappuccino is prepared on the basis of espresso, latte distinguish it from other proportions. Typically, cappuccino espresso and frothed milk taken in the ratio 1 to 2, classic cappuccino consists of one part espresso, one part milk and one piece of foam, and latte milk is used three times as much. Besides, latte foam is preparing more air and lush, and it is more dense cappuccino, its much thicker layer. If the foam for cappuccino prepared correctly, she stands on top rolled in sugar. Cappuccino is fed into the preheated bowl of a thick-walled porcelain or stoneware, to it relies teaspoon. Today it is one of the most popular beverages in the world. How to prepare a cappuccino at home? Something very difficult to prepare a cappuccino there. Especially, if the house has a coffee maker or French-press, but also quite simple Turk come down. If you have a coffee, so even with a device for frothing milk, it's all very simple - first brew espresso, whisk the milk with steam, into a heated cup pour one part coffee, two parts of frothed milk, and enjoy. We take quality, best freshly ground coffee, pure spring water, bottled. Coffee cook on low heat, as soon as the foam, dismiss, we wait, until foam falls, again put on a little fire, so repeat 5-7 time, In no case do not give coffee to boil. Prepare milk. take the whole, fat milk or cream (per serving - 100 ml), heated gradually to 50aboutWITH, be careful, heating usually small portions occupies no more than 10 seconds, and begin to whisk blender until large bubbles, as soon as they disappear, disable heating, the main thing here - not to overheat the milk above 70aboutWITH. Preheated milk can whisk and French-press. The mug 150 ml portion of coffee is poured, Part of the milk and foam, if desired crema chocolate sprinkle, cocoa or cinnamon. Where the name of cappuccino coffee? There is a legend, adding that the frothed milk in the coffee first came up with the monks of Order of Capuchins, so coffee with milk and cappuccino named. Some associate the name of this drink is the color of the vestments and views of the monks of the Order as a robe with a hood, similar to the color of coffee with milk and "hood" in the form of froth. After all, the name of the Order "Capuchins", It comes from the Italian "sappuccino", which means "hood". Whatever it was, but that in Italy there were the first mechanical machines for cappuccino using steam, used to prepare the foams of the heated milk. This principle is preserved in all the modern coffee machines from the production function of cappuccino. How and when to drink a cappuccino? 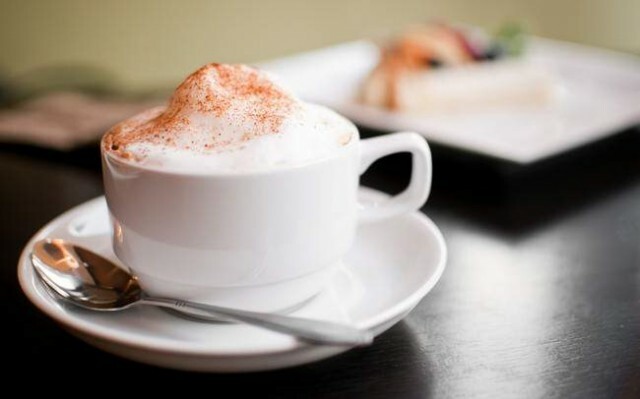 A cup of cappuccino, drunk in the morning - it's a great tool for courage and a portion of the body needs protein for good health - so say the Italians. In Germany and France, mainly in the evening drinking cappuccino, sprinkle cinnamon or chocolate, relaxing after a hard day. Rest of the world is drinking cappuccino, regardless of the time of day, just when the mood. gourmets say, what is right, it means drinking coffee at the same time with foam, and not to use it at first, separately with a spoon, as some. In this there is a certain reason, because the foam retains the flavor and temperature of the coffee, and if it is consumed without coffee, then lost the very meaning of cappuccino. Are there many types of cappuccino? cappuccino with cinnamon - this is when cinnamon is added to the coffee, and not simply sprinkled with foam. The novelty in the world of coffee - a beverage Gibraltar. It is distinguished from the usual cappuccino is, he served in a special transparent glass 'Gibraltar', in size it is slightly smaller than the usual mugs for cappuccino. It placed a double espresso, and frothed milk less, than usual, and whip it weaker, foam is very little. That's all, we wanted to talk about the beautiful world and delicious cappuccino. It is up to you, try, evaluate, Choose cappuccino taste! How to prepare a latte? How to grow and produce coffee?